The first idea of forming a ‘Handbell Ringing Group’ first stemmed from a ‘Church Without Walls’ initiative in the village. A concert was held in St Ninian’s in September 2005 with The Stewartry Handbell Tune Ringers performing a selection of handbell music. A few of the audience enjoyed the ‘hands on’ experience at the end of the concert. The Stewartry ladies offered us a set of handbells to try out in the hopes that a new ‘Handbell Tune Ringing Choir’ would be formed. Over the winter of 2005 a group of ladies tried out the Handbells and in January 2006 a core group of ladies agreed to form a choir. The cost of purchasing our own Handbells was the first hurdle. To raise our initial funds, a Concert was held in St Ninian’s with Upper Nithsdale Choir and The Stewartry Handbell Tune Ringing Group. We also we supplied teas/coffees for a visiting Car Rally. 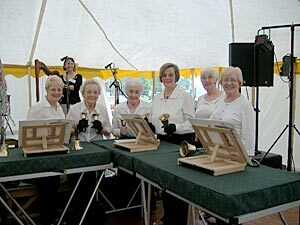 At the Moniaive Folk Festival Application for funding through ‘Awards for All’ and our ‘Local Area Committee’ proved successful and in November 2006 all monies were insitu to purchase a set of Schulmeric Enhanced Set of 37 Handbells with cases, cushions, tables and assorted music. We are a fully constituted group. MEMBERSHIP: Membership is open to all who express an interest in handbells. We have a core membership of 12 at the moment. AGE GROUP: The age group is from 14 years upwards, with the proviso that, Schools, Guides, Brownies, Rock Solid, Jam or any Youth organisation – can arrange to have hands on demonstrations with the proviso that their leaders, teachers (one adult to 4 children under the age of 14) accompany them and at least two members of ‘The Bells of St Ninians’. Our group is ecumenical and non-political. EXPERIENCE: None, if you can count the beats and keep in time you are almost there. However, it does help if you can read music. Our Musical Directors are: Muriel Young and Elna Wilson. SUMMARY: Over the years we have participated in local events, our own Church Special and Family Services/Moniaive Folk Festival/Moniaive has Talent/Penpont Christmas Concert/Kirkmahoe Church/Dumfriesshire Trefoil Guild and Thornhill Christmas Outdoor Market/entertained the Zambian Visiting Group, all with a measure of success.